Energy Technologies forte is the design and manufacture of rugged, high reliability products for critical applications in both normal and hostile environments. ETIs power products, available as either standard or custom versions, include AC and DC Uninterruptible Power Systems (UPS), Integrated Power Systems (IPS), Frequency Converters, AC Power Conditioners, AC and DC Power Distribution Units (PDU), and AC and DC Power Supplies. The field proven Rugged Power UPS line is ideally suited for defense, industrial and telecommunications applications requiring high reliability in a rugged rack mount, fixed mount or portable configuration. Available in power ratings from 1000 to 10,000 VA, these heavy duty units occupy a minimum of space and are light weight in design. Internally, all major components are well secured and electrically insulated to prevent damage due to shock and vibration. The internal input isolation transformer provides for both domestic and international voltages. The LED arrays keep the operator informed as to the unit's status including load and battery levels. All controls and protective devices are brought to the front panel with critical switches or breakers guarded. Further, all front panel devices are recessed to prevent damage or accidental operation. Both the input switch and isolation transformer provide double pole isolation for shipboard and submarine systems. The ETI0001-S1R was originally developed for the Navy TAC-4 program. These units have been designed to and successfully passed Mil Stds 167 and 901 for shock and vibration, Mil Std 461 for EMI/RFI, and Mil Std 1399 for shipboard and submarine applications. They have additionally gone through the notorious Barge tests with explosive underwater detonations, plus the grueling Belgium Block off road truck test. This unit is one of several models that are the Standard for defense programs including DTC-2, TAC-3, TAC-4, TAC-JW, NTCSA, JMCIS, JMOC, SNAP, MAST, BGPHES, TAMPS, Q-70 and NSSN. The ETI0001-1254 is the Standard used for the Marine Corps. AN/TPS59 radar upgrade program. Operating as both a UPS and Frequency Converter, this unit provides 2000 VA of 60 hertz power from any 50, 60 or 400 hertz source. This unit also has the unique feature of a drawout battery module, minimizing the time to replace batteries. As part of the N3 Series of UPS, this unit shares simplicity with flexibility. A single switch controls all operation, test and power functions. The Rugged Power family is available in a variety of output configurations, from standard NEMA 5-15R office style receptacles to threaded metal shell military styles. They are also available in a variety in input voltages. One of the newer options available with the Rugged Power and WorldPower lines is the 1 phase/3 phase input feature. This option allows the same unit to be powered from either a single phase or three phase power source. The ETI0001-1452 was developed for the Navys new submarine program, NSSN. This compact unit is a member of the popular N5 Series of integrated products. 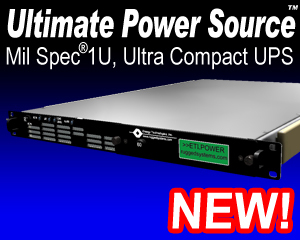 Producing 4000 VA of pure regenerated power, this unit occupies only 4U of rack space. The Rugged Power wide range input regulates the output without battery drain during severe brownout conditions. The N5 Series incorporates an intelligent Power Distribution Unit (PDU) in the same enclosure with the UPS and isolation transformer. This not only saves overall rack space, it reduces connections and cable runs improving overall reliability. The PDU interfaces with external load interlocks and thermal devices to provide safe operation under abnormal conditions. The Battle Short is able to manually override these safeties in the event of an emergency. The Display/Control Panel operates at logic levels and can be mounted on the front of the unit or remotely mounted at eye level in the rack or on the keyboard console. The WorldPower Series UPS product line is truly a global product. This series operates from all single phase voltages and frequencies around the world! Plus it will operate from a nominal 24 VDC source as found on commercial trucks, military vehicles and aircraft as well as in industrial process controls and radio/cellular systems. This light weight unit was originally designed for use in the Navy TAC-4 program where it successfully went through numerous tests including shock and vibration. Since both the Rugged Power and WorldPower lines can operate as power conditioners and frequency converters without a battery, this unit has been equipped with a hot swappable drawout battery module. This permits rapid field replacement without impacting the load operation. ETI also offers rugged, weather-proof transit cases with internal shock mounted racks of various sizes. By installing your equipment in an ETI transit case with a WorldPower UPS, you can offer your equipment as a field deployable product for use anywhere in the world! Rugged COTS and Full Mil Spec Rackmount or Universal Mount Uninterruptible Power Systems. PersonalSource Intelligent Uninterruptible Power Systems.